Process analyzer system integration provides solutions for gas and liquid measurements to support product refinement, process efficiency, and safety. Customers face real challenges in maintaining analyzer systems and automating process quality in their plants to achieve a vigilant system. Refinery, petrochemical, gas, and power plants must keep their process analyzers running with low cost of ownership. This can be achieved by the right choice of process analyzer and well-designed sampling system to analyze the components of interest. It is important to pass on analytical expertise to the next generation. Costs must be minimized in maintaining analyzer systems and improving process yield and throughput by using new technologies. On-line product quality control is crucial for ensuring plant safety. Yokogawa offers a one-stop solution and value-added partnership for analyzer systems. Core competence in process application know-how, analyzer products with system integration and the ability to provide worldwide consulting on effective analyzers and system solutions. More than 40 years of experience in measuring and analyzing physical properties and chemical components for liquid, oil & gas applications with more than 400 EPC projects delivered globally and over 150 analytical system engineers worldwide. Special systems such as LNG samplers, recovery systems, blast-proof & fire rated analyzer housings, auto-validation system, etc. Yokogawa is a reliable partner, recognized globally for quality products and execution excellence in process analytics. For global end-users and EPC contractors in refineries, petrochemical, and power plants, we deliver complete analytical solution packages as well continuous emission monitoring systems (CEMS) and water quality monitoring systems (SWAS/WQMS). Yokogawa, the leader in analyzer system integration (ASI), has a global network of system integration workshops. Main centers of excellence include those in Houston (USA), Singapore and Malaysia (Asia), Spain (Europe), Dubai (UAE), Seoul (Korea), and Bangalore (India). Please ask your local representative for your nearest ASI workshop. Optimized sample systems and correctly chosen process analyzers to improve analyzer availability, which directly affects your investment, has a positive impact on process control, and reduces unscheduled maintenance time. Providing all relevant information about your process (e.g. counting molecules) will have a direct impact on the overall performance of your plant. Yokogawa’s in-house analytical expertise can help you to design tailor-made solutions and thus reach your operational targets. Yokogawa provides new analytical sample system solutions when specific process conditions require a non-standard solution. Yokogawa’s team of specialists will discuss modified or new techniques or solutions required to achieve your process targets. Our reference installations range from extremely hot (more than 480°C) to extremely cold environments (less than −50°C) and to areas where severe corrosion can have effects on materials (salty environment, sour gas, offshore platforms). 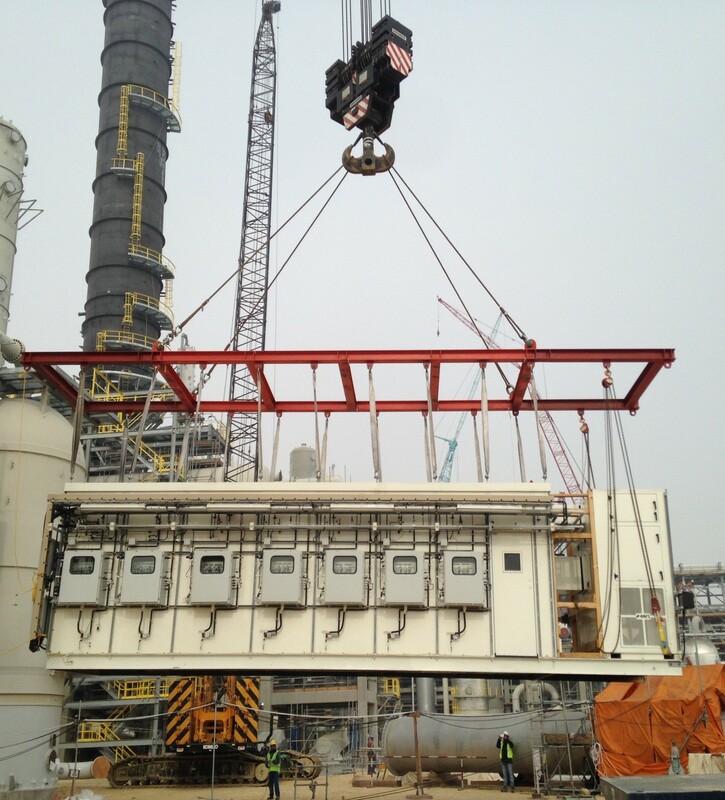 Compliance with global standards like ATEX, IEC-Ex, NEC, NFPA, CSA/FM, TRCU/EAC, etc. can be provided to meet project demands. Yokogawa provides customized analyzer shelters (housings) using steel, GRP or concrete, and dedicated systems mounted on a skid to separate from prefabricated buildings . Depending on the climate conditions, we can also offer shelters to protect analyzer equipment in cabinets. We supply all units fully equipped with Yokogawa process analyzers, third-party analyzers, sampling probes, sampling systems, data loggers, analyzer networks and complete subsystems to serve multiple lines and sampling points. 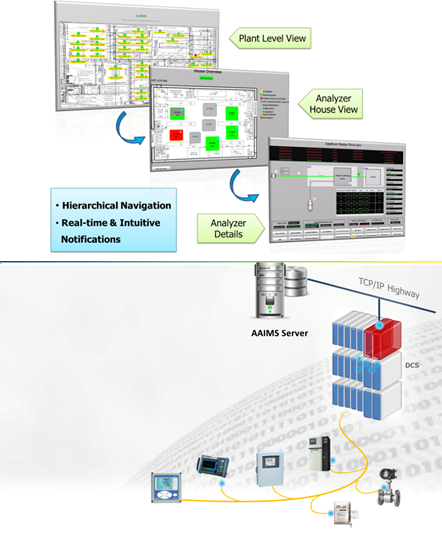 AAIMS: Advanced Analytical Instrument Management System is a core building block of Yokogawa’s VigilantPlant solutions designed for refining, petrochemical, pharmaceutical, chemical, power and other industries. Provides on-line validation of analyzers, data acquisition, alarm monitoring, etc.